June 27, 2016 – The booster for the world’s most powerful rocket, NASA’s Space Launch System (SLS), will fire up for a major ground test at 8:05 a.m. MDT (10:05 a.m. EDT) Tuesday, June 28, at Orbital ATK Propulsion Systems’ test facilities in Promontory, Utah. NASA Television will air live coverage of the booster test June 28 beginning at 7:30 a.m. MDT. 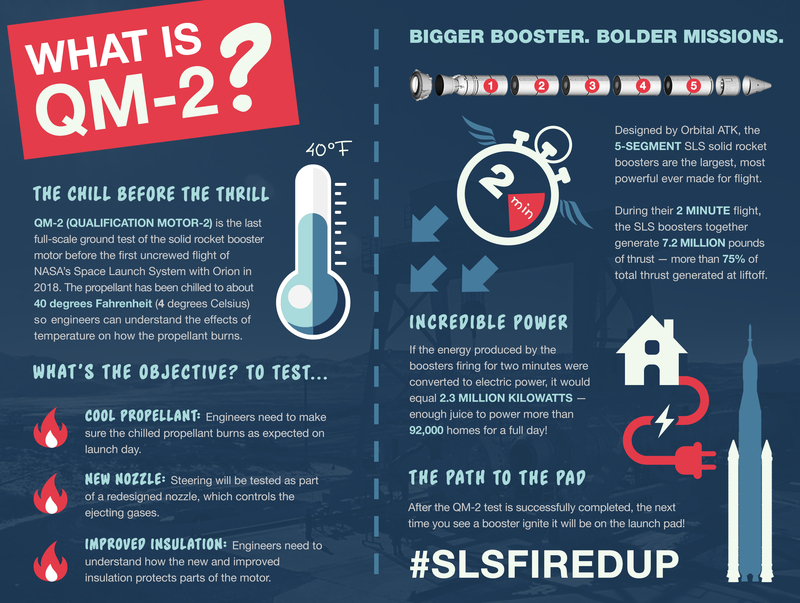 This is the last time the booster will be fired in a test environment before the first test flight of SLS with NASA’s Orion spacecraft, known as Exploration Mission-1 (EM-1), in late 2018. This is the second two-minute, full-duration qualification ground test for the booster. It will provide NASA with critical data to support booster qualification for flight and test the motor at the colder end of its accepted propellant temperature range — a targeted 40 degrees Fahrenheit. The first, full-scale booster qualification test was successfully completed in March 2015 and demonstrated acceptable performance of the booster design at 90 degrees Fahrenheit — the highest end of the booster’s accepted propellant temperature range. Testing at the thermal extremes experienced by the booster on the launch pad is important to understanding the effects of temperature on the ballistic performance of the propellant. The word “qualification” has become quite synonymous with testing and building the world’s most powerful rocket, NASA’s Space Launch System, which will make missions possible to an asteroid and the journey to Mars. So, what does it mean for rocket parts to be “qualified” for the mission of going to deep space? And how does that fit in to being ready for that first, uncrewed flight of SLS with the Orion spacecraft in late 2018? Setting requirements is the first step in the flight certification process and essentially answers the question of what the rocket is being built to do. For SLS, the vehicle has requirements to send humans on deep-space missions, including the journey to Mars. The next step is designing the rocket, and then construction begins before the next step of qualification testing. And that includes building flight hardware. Lyles says a common misconception about qualification testing is that it means the hardware and systems are “go” for flight. While qualification testing shows various parts of the rocket perform as predicted, NASA still has to integrate and test key elements of the rocket that work together during various phases of the mission. Green run testing at NASA’s Stennis Space Center near Bay St. Louis, Mississippi, will occur closer to the launch date, which is scheduled no later than November 2018. A countdown rehearsal, a type of validation test, will happen before SLS lifts off from the launch pad at NASA’s Kennedy Space Center in Florida. Engineers will load the rocket with propellant, drain it, and ensure all the ground systems equipment and processes are in place for that maiden flight. Along with testing and rehearsals, SLS has another program milestone to clear – design certification review. Already passing preliminary design review and critical design review, the rocket will be certified that it meets all design requirements. It will then proceed to the integrated test, checkout and flight readiness review. The initial SLS configuration will have a minimum 70-metric-ton (77-ton) lift capability and be powered by twin solid rocket boosters and four RS-25 engines. The next planned upgrade of SLS will use a more powerful exploration upper stage for more ambitious missions with a 105-metric-ton (115-ton) lift capacity. A third configuration will add a pair of advanced solid or liquid propellant boosters to provide a 130-metric-ton (143-ton) lift capacity. 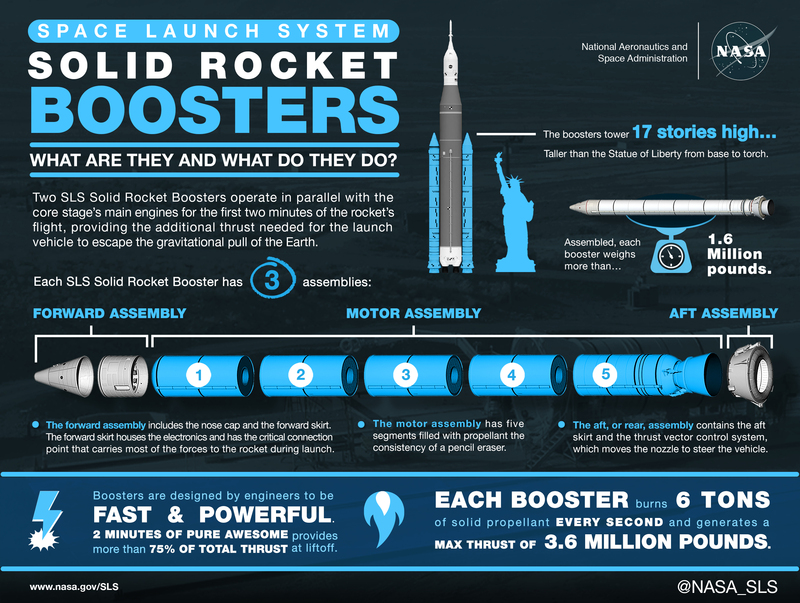 In each configuration, SLS will continue to use the same core stage and four RS-25 engines.